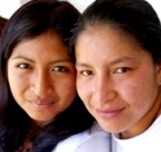 Women’s rights groups in Ecuador recently succeeded in convincing their government into reversing their stances and shut all the clinics, and reeducate the public about Ecuador’s incorrect previous stance on lesbianism. World News – Rights groups hail Ecuador’s crackdown on lesbian ‘torture clinics’. Thank you for your posts, Lexie. What you find newsworthy from around the world, I do too, and frequently I don’t see that item anywhere else. Keep doing what you do!! “Horrific” is the right word, indeed. Extraordinary that they were open so long.